How to Make Quick and Easy DIY Candles Using Old Crayons. Do you have children in your home? if yes! !, then is a good thing, i love children, so you have plenty of used or broken crayons that don't get used much ever again. Prior throwing them out and buying new other crayons. In my opinion you should think using them to make a great homemade DIY candles.This can be an advantageous step to turn them into something new and different again. Most children will like the idea of making candles from old crayons with you and enjoy this perfect way to make a handmade candles. Making DIY candles out of crayons may also be a great gift idea giving. First of all. Before you begin your DIY, you have to talk to your kids about safety . Since the crayons should be melted at an extremely high heat, your children will not have the ability to participate in this first step of the candle making process, because it's dangerous for them. Assure them that there are many other steps of the candle making they can be participate and be a part of this distinguished work. To begin, collect your supplies. In addition to the crayons, you should have a wax cartoon, this can be from juice, soy milk carton or fabric softener.Then you will need paraffin wax, two full ice cube plates, a double boiler, and white packing string. If you don't have a double boiler or you don't want to use them. You can use an old conserve or coffee can and a saucepan will perfectly work. Trim the top off of the wax carton, leave the wax carton about six inches high. You should cut the string at least 8 inches long. You will later cut the wick to appropriate the holder. To make sure a wick that burns up easier take three parts and bread them alongside one another. Now, use smaller pieces of string to tie the sides together. The holders for your candles can be whatever you desire sso long as they they can be non flammable,like a nice vases glasses, and jars are very proper. Now ,melt about three pounds of paraffin wax in your double boiler or your old conserve can. To greatly help it melt perfectly and faster, cut it into small pieces. The melting process will take quite some time about 15 to 20 minutes. Ok as the wax is melting, peel the papers from the old crayons. You and your kids can choose to separate the colors by lights and darks to truly have a combination that melds well or you can mix it all alongside one another and discover what the color ends up being. To keep getting great results with your DIY candles. You must add the crayons to the wax after it has perfectly melted in good condition. After the crayons and wax have both melted together, you must remove the mixture directly from the stove and pour into your candle holders. 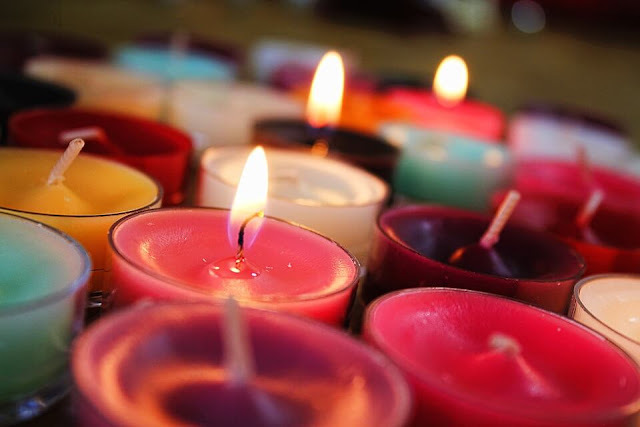 If you would like to make perfumed candles try adding a splash of vanilla or cinnamon to your hot wax mixture. Make sure that the candles by left alone to totally harden. It is important that you have an area this can be completely done without any disruption. It is also important to make sure your little sweet kids can’t reach them, as out of inquisitiveness they may want to take a look or check on their candles. The wax will stay hot for a few hours and can burn the skin, so you must be attention. Making candles from crayons is a fun way to use up your old crayons. and it's a fun way to spend your free time creating a neat project with your kids .When you finish your creative DIY ,you will now have a beautiful and lovely candles .I think these make darling gifts.